If someone you love is crazy about chocolate, they'll lose their mind over this decadent cheesecake dessert from Juniors. Famously founded in 1950 in New York, Junior's created The World's Most Fabulous Cheesecake®. The only cheesecake maker to use 100% real Philadelphia® cream cheese, fresh eggs and vanilla, Junior’s hand blends the rich batter in small batches for maximum taste, flavor and freshness. Dressed up for a special birthday occasion, this NY cheesecake is layered between rich, chocolate layers of devil’s food cake and topped with fudge frosting and giant chocolate chips. Kosher Dairy Kof-K. Serves 12. Net wt. 3 lbs. 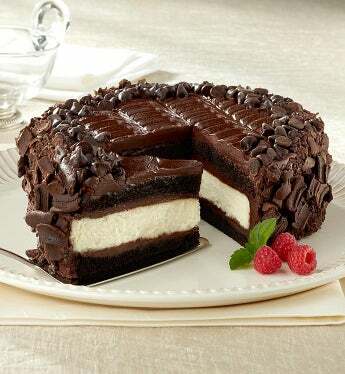 7” Junior’s® Devil’s Food Cheesecake. This gift includes fresh ingredients and requires 2-Day delivery. If someone you love is crazy about chocolate, they'll lose their mind over this decadent cheesecake dessert from Juniors. Kosher Dairy Kof-K.